Lambert Brothers Haulage Ltd is one of the largest independently owned road transport companies in the UK providing a wide range of transport & storage services. The company has an impressive 8.5 acre site with a 150,000ft² of storage facilities as well as over 68 vehicles & 75 trailers of various types. The company, based in Eastleigh has its own drivers & vehicle repair centre. Ray Lambert, the chairman of Lambert Brothers needed additional office space & HMF were asked to provide a quotation for fitting this out as main contractor. 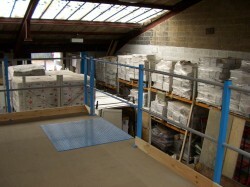 HMF specified a steel joist mezzanine floor to be fitted above the office area to enable access of archive materials up onto the archive store above, as well as potential additional storage space. 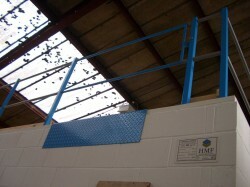 This also allowed the mezzanine office to support the office ceiling & mechanical & electrical services. HMF carried out building works including new blockwork & removal of existing masonry walls. External rendering was carried out to match the texture of the existing building. Furthermore, HMF fitted the mechanical & electrical installations to include a new energy efficient inverter heat pump air conditioning system, as well as extending the existing heating system within the building. Lighting was specified as high frequency modular lighting, which again was energy efficient. 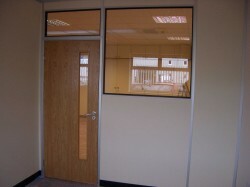 The offices were constructed from demountable & relocatable metal stud partitions which will allow Lambert Brothers easy future flexibility as the partitions are built up to a new suspended ceiling & as the mezzanine floor is self-supporting & therefore do not form an integral part of the roof structure. The use of demountable & relocatable systems enabled the installation to be built quicker than conventional building materials would permit, thereby allowing Lambert Brothers the use of their offices sooner and with less disruption. The extension of the offices has enhanced the working space & the general atmosphere of the office. The programme for this £43,000 project was an 8-week build, which was completed on time despite additional works being added during the course of the project.